Never underestimate how hard it is to be a food photographer. There are two people I discuss ice cream making with. My father and my friend Lucy. 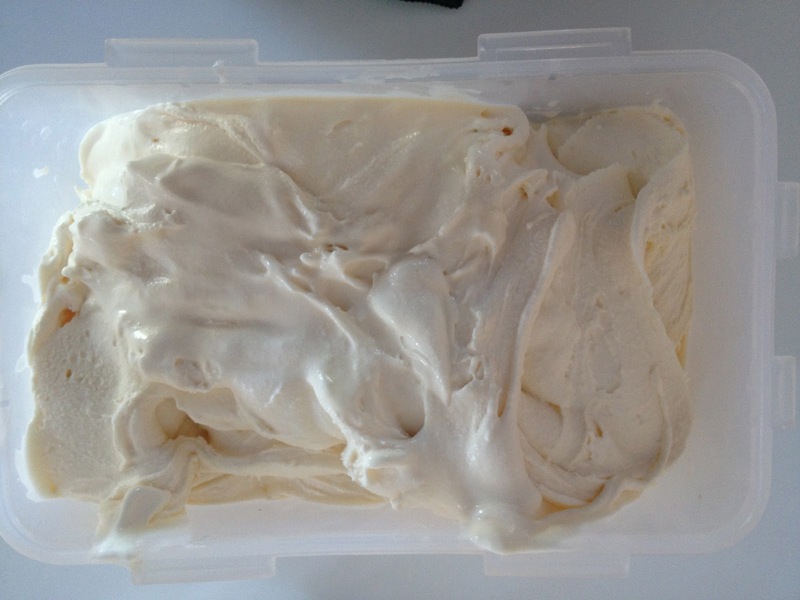 Recently Lucy told me about an unassuming little recipe she had come across for vanilla ice cream that was different to the way we usually made ice cream: instead of the custard method (which uses just the yolks of the egg), it used the whole egg. This was of particular interest to me as I make lots of ice cream and my freezer is overflowing with egg whites. There are only so many madeleines I can make. This vanilla ice cream recipe is also great because it’s quick, easy and makes a lovely light vanilla ice cream that scoops straight from the freezer and children, in particular, seem to love. I would probably go with my more luxe version if the ice cream were being served at a really posh dinner party, atop, say, some exquisite piece of patisserie. I’ve adapted the recipe slightly (lowered the sugar from 100g to 80g and slightly changed how you make it). Get three large bowls. Separate the egg yolks and egg whites into a bowl each. Put the cream into the third bowl. Add the vanilla essence to egg yolks. Do it NOW or you will forget and without it, you have Fior di Latte ice cream, not vanilla. Add the sugar to the egg yolks too. Take an electric hand held whisk. Whisk the egg whites until stiff. Then the cream until it holds itself properly, like a well trained ballerina. Finally the egg yolks, sugar, vanilla essence. Now gently fold the cream into the egg yolk mixture and finally the egg whites. Put in ice cream maker. If yours is very small, you may have to do this in two batches. I have a Magimix and I put it all in, it comes right up to the top but it reduces as it’s being made. You can of course have this on its own. Make tiramisu with it, it goes great with a fruit salad. Or fold in some chocolate coated popping candy for something a bit Heston. This entry was posted in Celebration, Children, Ice cream, Parties and tagged vanilla ice cream on September 15, 2012 by Annalisa Barbieri. Ooh my dearest you know you're WELCOME.IT'S ALRIGHT FOR US, EH? PMSL. Actually, Cornetto Enigma is one of my FAVES. But yeh, generally, shop bought stuff isn't good enough and I only post stuff like this TO MAKE YOU FEEL BAD.